Hi there, how are you doing? I hope you have had a good couple of weeks. Mine have been good and very entertaining. So on Wednesday 21st October it was “Back to The Future Day”. The actual date Marty and the Doc headed to when they went into the future in the 1989 film Back To The Future II. If I am honest the biggest issue for me with this was that as someone who remembers 1989 and who is now living in the actual 2015. I have not really noticed much of a difference. Except we do have a bit more technology at our disposal. And I have got a little bit older. Well at least physically so, if not mentally so. That and of course the film makers were wrong about us having flying cars and hover boards now. Which with the amount of air traffic controller strikes in Europe, is probably a good thing. So what does all this really tell us? Well surely do not take fun family films set in the future too seriously. Or expect them to predict the future. That said it would still be pretty cool to own a DeLorean. While we are talking about blasts from the past. TFI Friday has returned to Channel Four for a one off series. After the success of the one off birthday special earlier in the year. I used to love the show when it was on first time around in the ninety’s. It was at the time when Brit Pop was possibly at its peak and Chris Evans was flying on the Radio 1 Breakfast Show. As well as presenting the official start to everyone’s weekend. 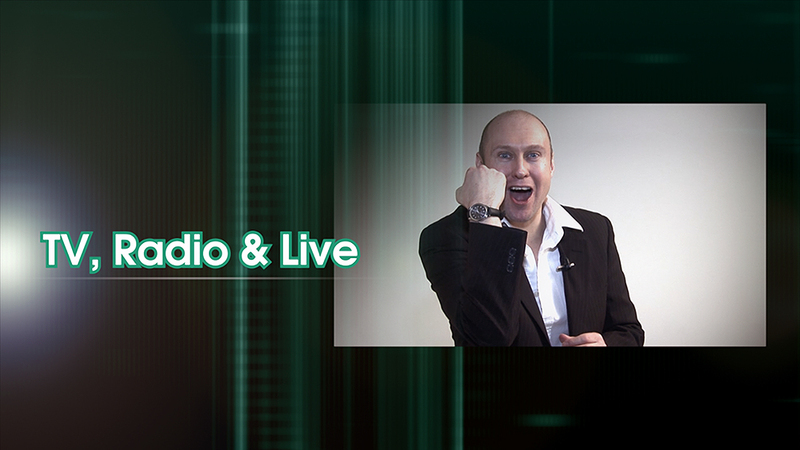 Live from the River Side Studios at 6pm every single Friday night. It was listening to him during those Radio 1 days. That made me decide that I wanted to work in radio. It sounded like he was having the time of his life every morning and then you could see the pictures proving that he was on the television every Friday. First time around the show did seem to get crazier and weirder the longer it went on. But then we have learnt since, thanks to his books. That it was only really echoing his personal life. And the direction that was heading in at the time as well. It did however make for must watch television. As you really did not know what was going to happen next. And a lot of the time, I am not totally convinced he did either. I have really enjoyed the revival series so far. The guests have been amazing, U2, Take That, Steve Coogan, Dawn French, and actor Nicholas Hoult to mention just a few. The latter having the honour of being the first person to swear on this new incarnation. Even though it is now on at 8pm instead of 6pm. It was still very inappropriate for that time of the evening. But with plenty more shows still to come, you would not bet against him being the last person to do that. I think may be because it is such a mad atmosphere, that kind of feels like you are just out in a pub with a few mates. It sees people so relaxed they almost forget where they are. And that they are on television sometimes. It is my dream to be in that bar having a few drinks on one of the current shows. That would be amazing! It is still brilliantly odd and unpredictable. They will get people in to be guests and then just give them thirty seconds on the show and make them do ridiculous things. Chris is a bit older. And we all know he has calmed down a little bit. So it is slightly harder to conjure up exactly the same magic as before. But he looks like he is enjoying it. And even all these years on. There is absolutely nothing like it anywhere else. It is positively unique. And he is using it to get all his family and even some of his ex wives some air time to. Good luck to him, if you are in that position of course you would do that. I am still hoping I might just get the chance to see one of them live in the studio before this series ends. I was at the lovely Tabernacle Arts Theatre in London the other week. To celebrate another television programme enjoying an anniversary. Would you believe that the Fast Show is Twenty-One this year. To mark this occasion I was there for a recording of a special show featuring its two creators Paul Whitehouse and the excellent and very personable Charlie Higson in conversation with Danny Wallace. They talked about the show, how it came about, what it was like making it and much more. Then played a few classic clips and sketches from it. I am not sure exactly when this will be shown on television but it is certainly worth keeping an eye out for it. I had a very enjoyable time there. And credit where it is due. I have to say the fish and chips I had there before the show were very nice. So compliments to the Chef. Who judging by the amount of other people who were dining was having a very busy night. 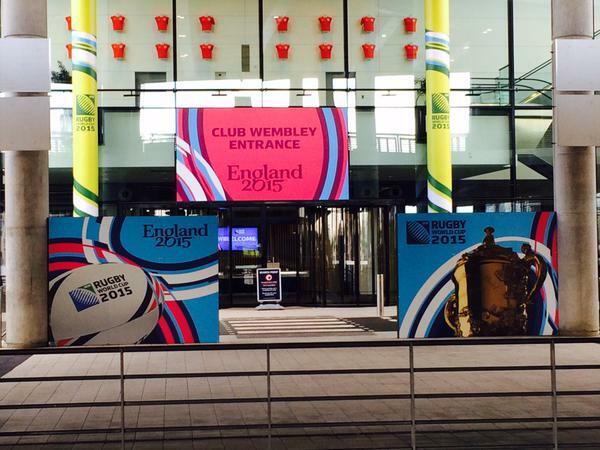 A member of the Wembley Stadium management team is leaving this week. So the other day we held a surprise social gathering and presentation for him. It was in one of the brilliant pitch view restaurants there. We got there first and then he was lead in to the room to applause and cheers. Then a few people gave some short speeches, talking about his time working there and also including what he did before he joined the place around thirty-five years ago. Here is what he used to do. And how cool is this? He is a hugely accomplished Bass Guitar player. Who used to be in a big rock band called Taste. They played in front of around two hundred thousand people at the Isle Of Wight Festival in 1970. 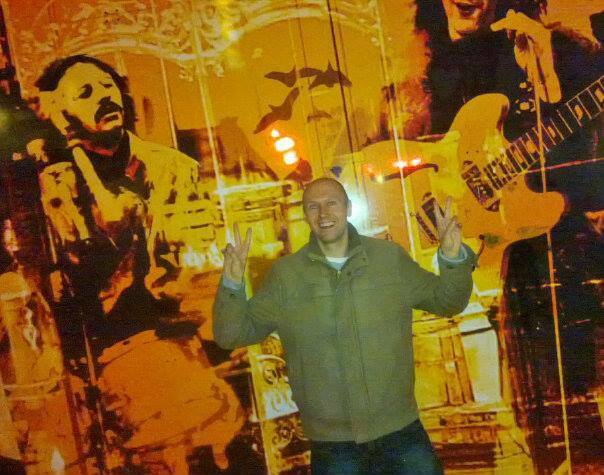 On the same bill as Jimi Hendrix and The Who. I have seen the footage on DVD and it looks amazing. He went on to play with several other bands including The Spencer Davis Group for a few years in the seventies. A really top bloke. And such a talented fella. I would very much like to wish Charlie McCracken all the best for the future. 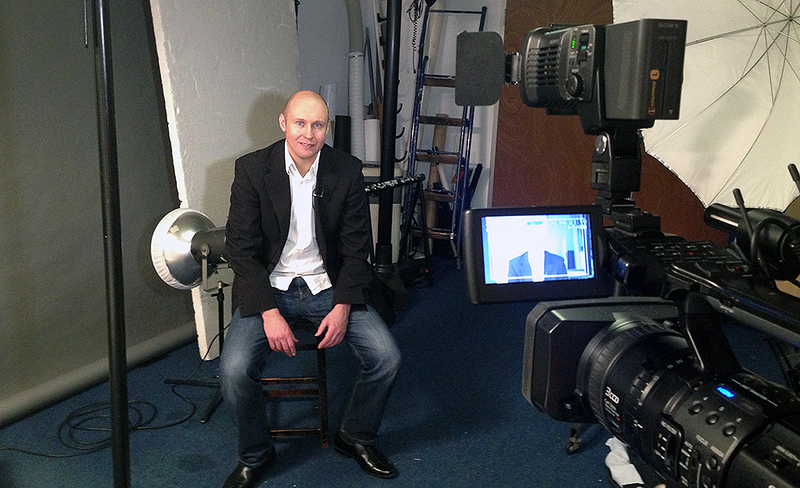 Last Sunday I was again working behind the scenes for the latest NFL game at Wembley Stadium. It was a big clash between the Jacksonville Jaguars and the Buffalo Bills. It is always such a fun event to be involved in. During the course of the day I ended up escorting the Jaguars Video teams to their positions for the game, showing coaches and owners to their boxes, plus helping the VIP guests get to and from pitch side to watch the players warm up. And finally directing the Bills to their team buses at the end of the contest. Always an interesting day. You get to help and meet such interesting and lovely people. Congratulations to the Jacksonville Jaguars who won their first ever game in London beating the Buffalo Bills by 34 points to 31. Their owner Shahid Khan also owns Fulham Football Club. So the whole of the American Football Team squad went and saw their English football counterparts play at Craven Cottage the day before. Seeing them come from behind to win clearly also inspired the American team. 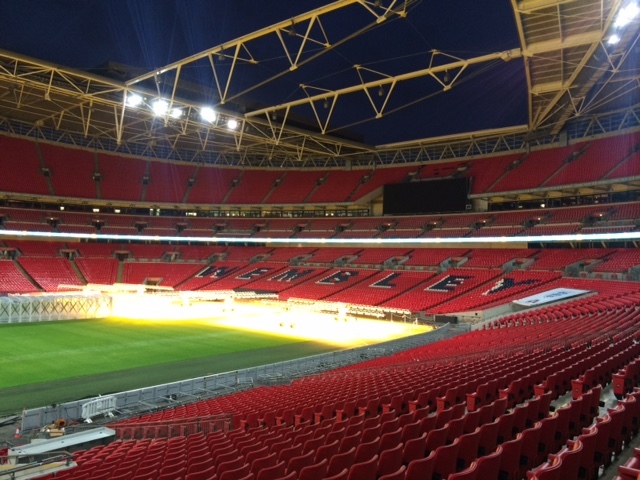 A win in London is good news as they have signed to play one game a season at Wembley for the next five years. I asked one of the coaches from the Jaguars just before kick off. If he had enjoyed his latest trip to London? His answer was “I will let you know in about four hours”. With a win under their belts as they flew home on their plane that evening. I am guessing that he did. Having worked in the radio industry for more than a decade I know lots of different people from all over the country. Due to the nature of the beast you just have to up sticks some times and go where the work is. One of these people is my mate Robbie Lane. He now lives in Lincolnshire. 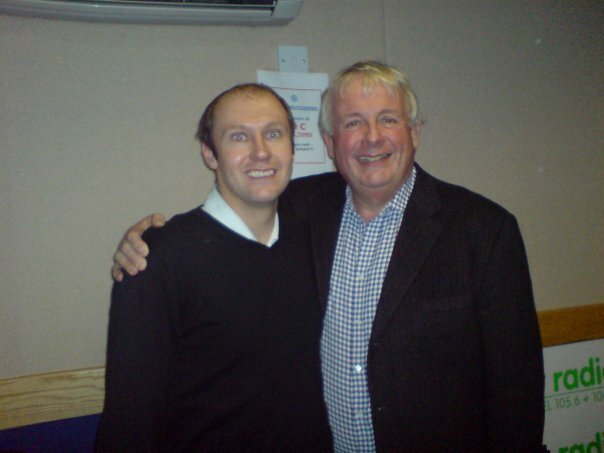 But I met him when we were both working at Ivel fm in Yeovil. He happened to be in London the other Monday and organised a get together with me and a few of his other friends, in a nice restaurant in Covent Garden. We went to the exquisite Tuttons. As it happened I had actually eaten there once before. A while ago now, as part of my twenty-fifth birthday celebrations. It is in a great location and if you can get a window seat. You can see all the goings on at one of the capitals most popular tourist attractions. Which if you like people watching as much as I do is fantastic. The menu was impressive and varied. The staff and the atmosphere in there were also both great. Just in case you wanted to know. I had the Lamb Cutlets, which were delicious. It was really nice to catch up with everybody. I do like eating and talking, two of my favourite pastimes. So it was another fun night looking back at the past and forward to the future at the same time. I am still enjoying Strictly Come Dancing. Even though my favourite couple of Jamelia and Tristan continue to struggle and ended up in the dance off last weekend. Thankfully they in my opinion deservedly survived leading to Ainsley Harriott and Natalie Lowe leaving the contest. Don’t get me wrong I do like them both to, but I did think my girl did perform slightly better on the night. The competition is very fierce this year and a lot of them could be in with a chance of walking away with the glitter ball. Statistically it is looking like it will be a women who wins. Mainly because all the celebrity’s who have gone so far this time around have all been male. I think Jay McGuinness and Peter Andre are the only two men, who can possibly trouble the ladies for the series title. As ever good luck to all the couples ready for this weekends Halloween Special. The countdown is on to my absolute favourite television show of the year. I’m A Celebrity Get Me Out Of Here. Ant & Dec are hilarious on it. They are just so good at poking fun at all the camp mates. ITV have not confirmed the exact date it will start yet. But have said that it will be around the middle of November. Already the rumours have started about who will be doing it this year. I hope they are fun and up for a laugh. As well as the challenges. I am hoping there will at least be a couple of people that I have met in the past in there. I have met four of the previous Kings or Queens of the Jungle in the programmes, now thirteen year history. Do not expect me to do much during the three weeks it is on, watching it will play a large part in most of my evenings during that time. It is the best thing on television in my humble opinion. In the next week or so I am very much looking forward to seeing the excellent comedian Sean Lock perform live for the first time and seeing the latest show from Derren Brown in London. I have been to one of his stage shows before. I love what he does and think it is so clever. I would like to have his skills. When it comes to pretending that he can mind read. That would be great fun if you could do that. If it was used in a responsible and fun manner like he does, of course. I will tell you about both of these things, when we speak next. Hi there, how are you doing? I hope you have had a really good couple of weeks. Mine have been busy with lots going on. I do spend a lot of time in and around London. Which with my tea drinking addiction means I visit a lot of Coffee Shops. To keep myself topped up or sometimes just to kill some time before meetings. I went in to one of these establishments at Waterloo Station recently. It was the chain where they ask you your name and then write it on the cup, supposedly to make it easier to collect your drink when it is ready. It always seems a bit of a waste of time though when you order tea. As they generally do this straight away and then hand it directly to you anyway. I was pretty sure when he asked my name I said Neil but I can only presume he did not believe this and actually thought I was a character from The Matrix. 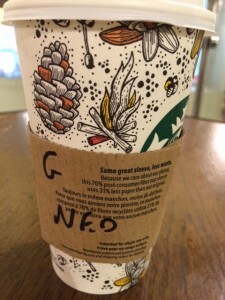 As when I received my cardboard container of tea it said “Neo” on the side. 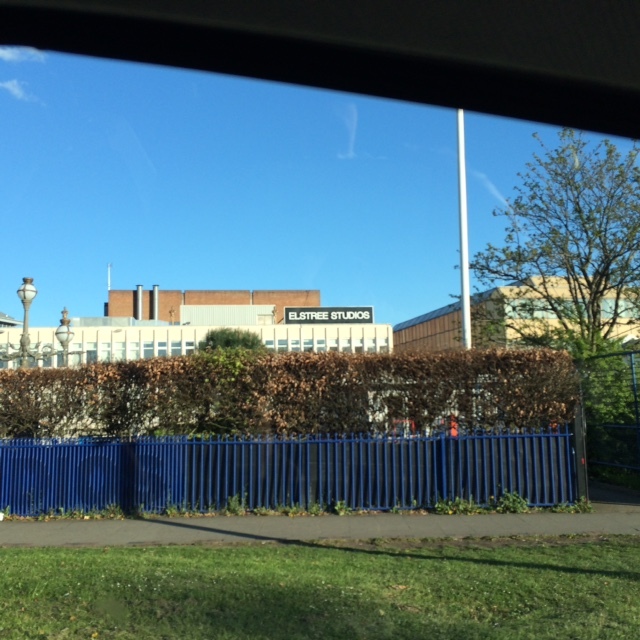 I was back at the Elstree Studios the other Friday to see another edition of Celebrity Juice being recorded. It has since been shown on television. It was the one that featured Ben Hanlin, Sara Cox, Rylan and Judge Rinder. It was totally hilarious. And if you thought some of the stuff that went out on air was too rude. You should have seen some of things that did not make the final edit. It was a bit of a crazy evening and it is fair to say that a couple of the regulars really got in to the spirit of things. At one point Holly was threatening to try something that she believed she could definitely do. But was actually so dangerous the stage manager had to step in and stop her. Judge Rinder looked pretty confused through pretty much all of it. If you saw it on TV you will know. He read out two of Lemon’s Law’s on the show. There was a third one that they got him to read out in the studio, which almost caused me to hurt myself laughing but which can very much not be repeated. It was as ever a good fun evening. I was sitting right at the very front in the middle. I was that close I could have almost reached out and touched Keith Lemon. It was brilliant to see Sara Cox in person. I have liked her on the radio for years now and I think she sounds excellent on the Radio 2 Breakfast Show. When she stands in for Chris Evans. Rylan seems like a very nice bloke, who is up for a laugh and doesn’t take himself to seriously. And I will never tire of seeing Holly Willoughby in action in a TV studio. 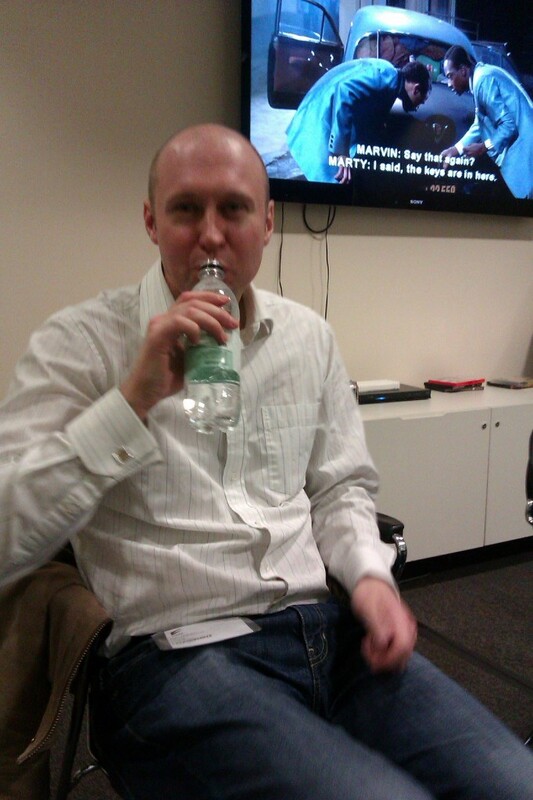 Last time we spoke I said it would be good to see Andy Collins again. Well I did not have long to wait, as he was doing the warm up duties for the evening. He was on top form. And kept the whole audience pretty much on the edge of over excitement all night. If you saw it, you might have noticed a lot of the crowd were standing up and cheering. They were so hyped up. It is such a wild and crazy show but so entertaining. And such a good laugh. 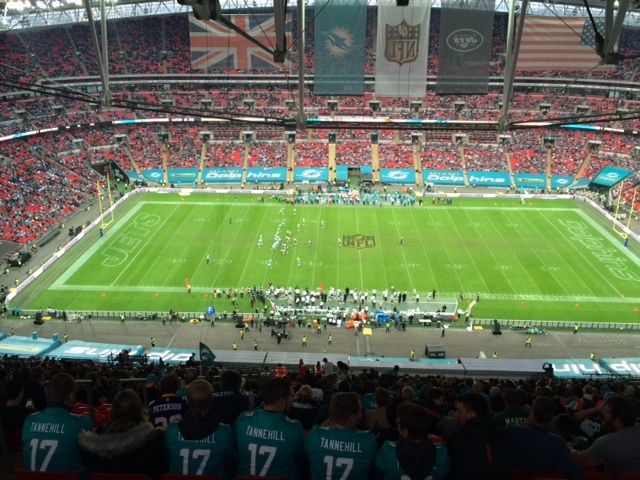 I was working behind the scenes at the NFL American Football Game between the Miami Dolphins and the New York Jets at Wembley Stadium a few Sunday’s ago. It is always a huge spectacle, when they come to town. From the pre game gatherings in Regents Street in London the day before to the big fan park that appears outside the ground on match day. The whole thing just builds and builds right up to kick off. My role was to assist VIP guests to get to where they needed to be. This included showing one of the Miami Dolphin’s Vice Presidents to their Box. Taking the coaching teams to and from the vantage points that they were watching the game from. And directing the New York Jets players back to their team bus. I also got to witness Laura White sing the National Anthem before the start. She has an amazing voice and always does a splendid job. I did also manage to spot the force of nature that is David Hasselhof pitch side, enjoying the game. I quite like watching American Football but I can’t claim to completely understand how it works. But it does seem very tactical. I did not have a team that I supported. 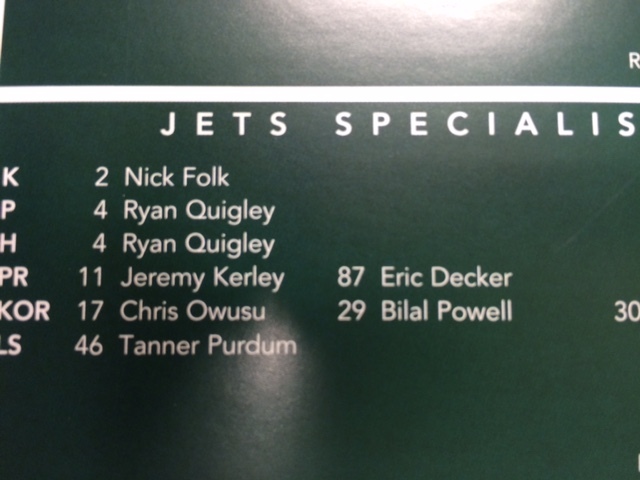 But this may now have changed as I discovered that I have a namesake playing for the New York Jets. Ryan Quigley wears number four and is the Punter. So therefore I am now adopting them as my NFL team. Well at least until he either leaves the club or retires from the sport. So as I said I had to help show the players back to the team bus after the match. They were all so polite, nice and a pleasure to work with. To put this in English Football terms that would have been like me talking to all the Tottenham Hotspur squad. Which would have been amazing and highlights how cool this was, to be that close to these superstars. If you think our footballers get paid a lot of money have a look at what some of the big NFL stars get paid. As ever it was a terrific experience working at this event. I am hoping I may also be involved in some way in the other two matches that will be taking place at Wembley Stadium in the next month or so. 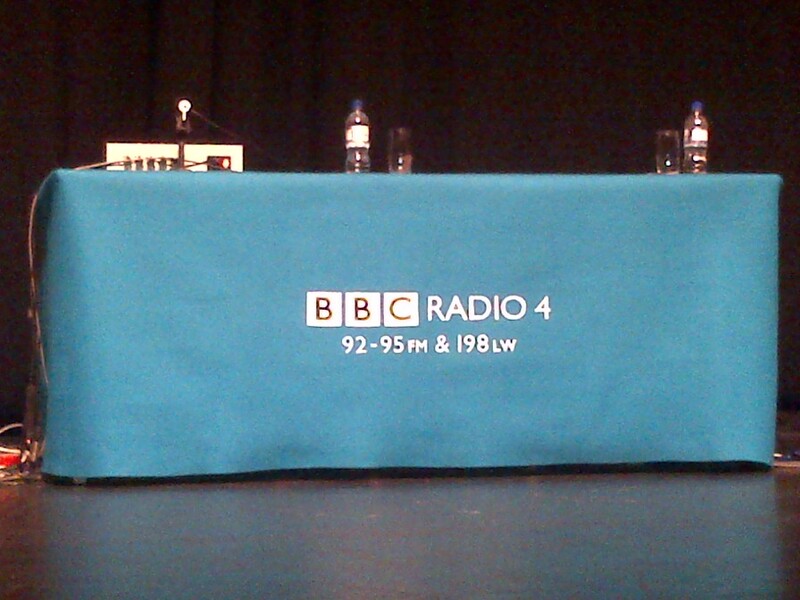 It has been another brilliant series of the Radio 4 Extra topical news show Newsjack. The last episode of the current run was on Thursday night. I have really enjoyed writing jokes for it once again. Several of my jokes have made it in to the scripts and been performed in front of the live audience during its recording. But unfortunately none of them have quite made the edit and made it on to the show this time round. It will next return to our radio’s for a new series in the new year. Congratulations to all the writers who had their material included. Having experienced it in the past it is a nice feeling and gives you a nice warm glow. When you get something on it. The cast and producers have done a wonderful job and I have really enjoyed listening to each programme. It is no secret that I am a massive comedy fan. A couple of years ago now I got to see the Geordie Chris Ramsey perform at the Queen’s Park Art Centre in Aylesbury. As part of the Tringe Festival. It was just at the time when he had filmed the sitcom Hebburn. But it had not been on television. So I guess you could say it was just before his career really took off. It was basically a warm up gig for his Edinburgh Festival Show about rolling the dice and the concept of chance. It was proper laugh out loud funny. There is actually some video footage of me reviewing this show somewhere. In it I am pretty sure I said something along the lines of “with his slight Geordie lilt, it is just like having a lovely chat with a mate” it all felt very warm and inclusive. He is returning to the Queen’s Park Art Centre next year on Friday 4th March. With his latest show “All Growed Up”. I would recommend going to see it if you can. You will not be disappointed. 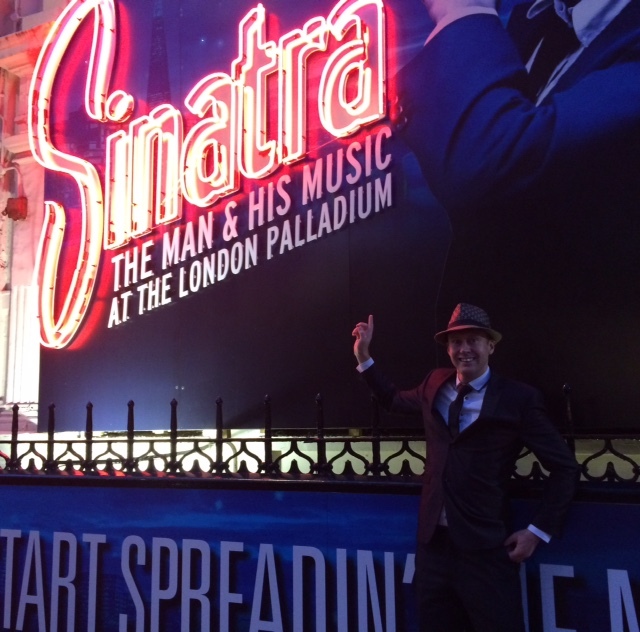 I had a brilliant evening at the London Palladium seeing Sinatra recently. Firstly I have to say it is just such a great and iconic theatre to be inside. Just being there gives me a buzz. The show features a twenty-four piece orchestra and a massive troop of dancers plus video footage of Frank Sinatra himself. Who appears singing all the songs and telling you little snippets about his life. So you get a brief behind the scenes history of his career in his own words. And a great selection of his best known songs. In effect performed on stage by him. It is all very cleverly done and nicely put together. During the interval I got talking to the man sitting next to me. It turned out that he was a huge Sinatra fan. And that he had actually been at the Palladium watching when “Ol Blue Eyes” made his first appearance on stage there in 1950. It was a brilliant show, which has now sadly finished in London. I saw one of the last West End performances of it. To make the evening a bit more authentic the person I was with suggested we should drink Whiskey during it. I am not even really a fan of the drink at all, but I went with it and oddly it did feel right and add to the occasion a little. I was very sad to hear of the death of Jim Diamond. A lovely man and amazing singer. I had the pleasure of interviewing him once when he came in to my radio show at Ivel fm in Somerset. A total professional and very easy person to talk to. I do remember having a slight argument with him about his best song. I was saying it was “I should Have Known Better” and he was adamant it was “I won’t Let You Down” which he released when he was the lead singer with the band PHD. On reflection he was the best man to judge it, so I am happy to accept his suggestion as the correct one. Then on the day things got even better. 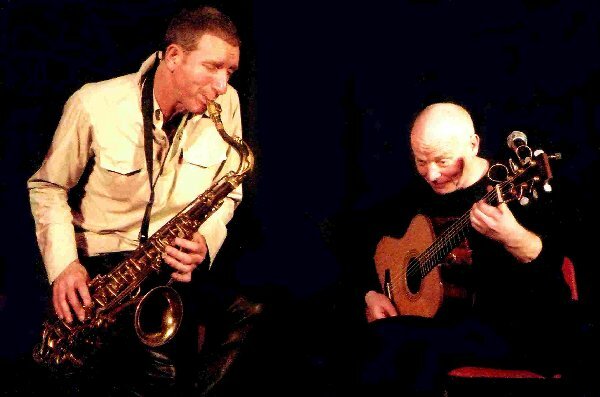 When he got out his guitar and was joined on the saxophone by the legendary Snake Davis. He performed a couple of live acoustic songs. His voice was out of this world and it honestly made the hairs on the back of my neck stand up. It was an big honour to see him and Snake play in that small room with just me sat in there with them, listening intently. RIP Jim. My chosen couple on Strictly Come Dancing this year nearly fell at the first hurdle as Jamelia and Tristan found themselves in the bottom two on the first vote off moment. Happily they survived and Iwan Thomas with his partner Ola Jordan became the first couple to leave. I am still sticking with them as my favourites. Even though I have to say other partnerships are looking much better notably Jay McGuinness and Aliona Villani. Their Pulp Fiction inspired Jive was ridiculous for week three of the competition. Anthony Ogogo and his partner Oti were the next two to go. I always get drawn in to this show. I love it and know absolutely nothing about dancing. I only lasted just one session when I tried Salsa lessons, many years ago now. Once again Zoe Ball and the team are doing an amazing job on It Takes Two. The nightly spin off show. Where you get all the behind the scenes gossip and can just enjoy the wonderful relationships developing between the celebrities and their professional dance partners. I am still hoping to find time to go and see one of the live Saturday shows his series. Fingers crossed. Hi there, how are you doing? I hope you have had a good couple of weeks. Mine have been great with lots of fun things going on. We are in the middle of the Rugby Union World Cup in England currently. I cannot claim to be a massive fan of playing the sport and hated it in games lessons at school. I had to go in the scrum as a second row forward. When I would have much rather stood out of the way on the sidelines as a winger. As I could have just avoided the ball more and stayed away from the action. I am always happy to watch and support England in any competition. I made sure I caught the Opening Ceremony on television. I thought it was really good. A twenty minute production with more than a couple of nods to the Olympic opening in 2012. Including another Royal on screen cameo. This time from Prince Harry. Who also delivered a speech from the centre of the pitch. Which I thought was very nicely done. 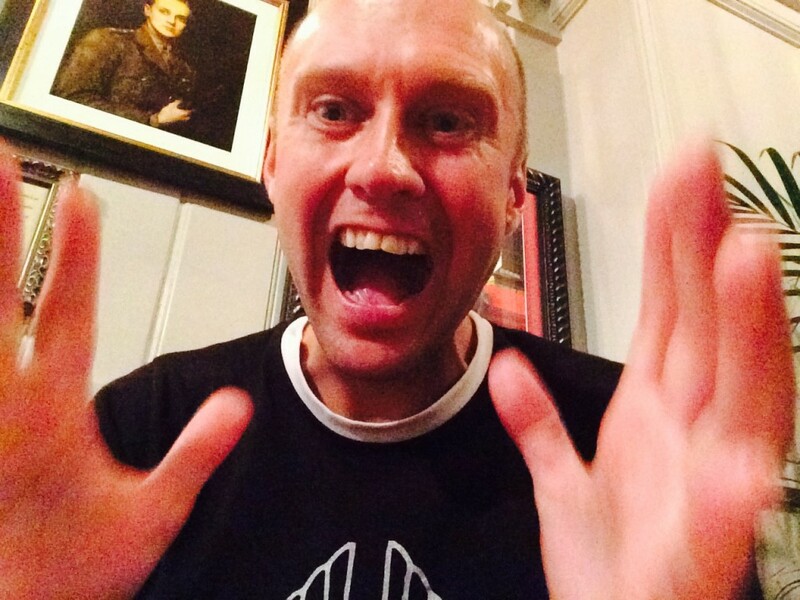 Also well done to the comedian, TV Warm Up Man and Buckinghamshire resident Andy Collins. Who was charged with getting the capacity crowd fired up and ready for when the eyes of the world were on them. I look forward to hopefully bumping in to him at a television studio, once again in the near future. 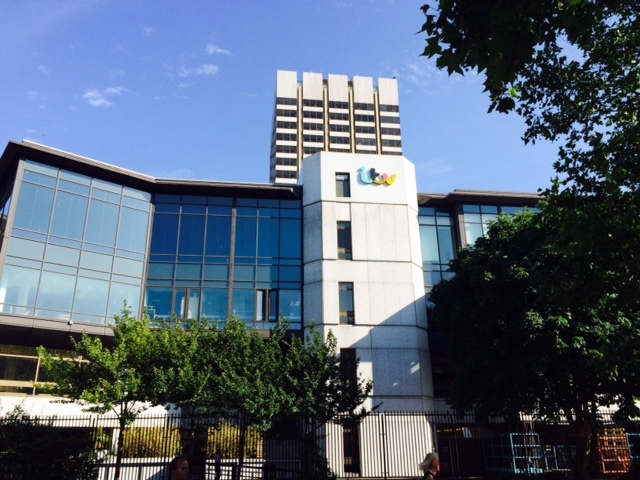 I had a brilliant morning at the ITV Studios on the South Bank the other week. I was there to help a production company called Chalkboard with a live run through of a brand new game show. That they are trying to get commissioned. And hopefully on our televisions soon. They are a fantastic group of people very friendly, enthusiastic and professional. We all met up in reception before heading in to the lift and up to the Thames Room. We got set up, had a cup of tea and a quick practice of the game. Before the TV executives that we were trying to impress arrived. We were also joined by two French TV Producers. Who have already made a pilot version of the quiz, that we were show casing. I have seen a clip of it and it looks great in their studio. The executives arrived in the room. And me and my co-contestant Rob played a couple of rounds of it. So they could see the format. How it plays and all works. It went really well and everybody left the room happy. Fingers crossed they take the show and then make it. It would be nice to see something that I have played a very small part in the development of, being successful and getting a good run on the television. If and when I get any news that I am able to tell you, rest assured I will. I am a massive fan of live theatre and musicals but I very rarely watch any films. About a year ago I saw the Jersey Boys movie and absolutely loved it. Since seeing it at the cinema I decided that I really wanted to see the stage version. Which was about long before the film. 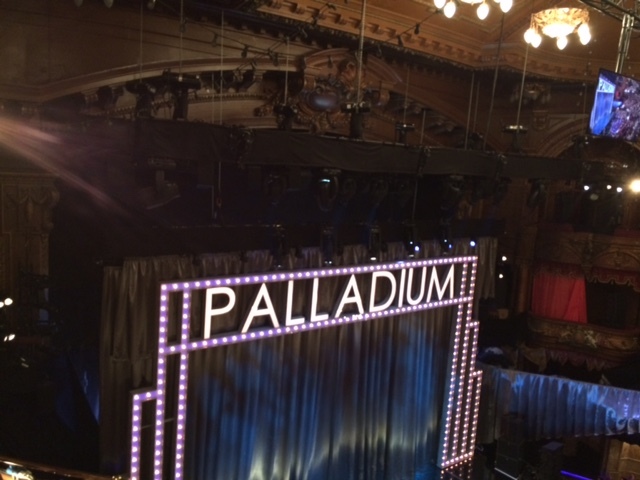 Finally last week I managed to find some spare time and catch the matinee at the Piccadilly Theatre in the West End. It tells the story of the group the Four Seasons, from the very early days through to the end of their careers. While giving a good feel of what the area of America they came from, was really like back then. It is pretty real and gritty for a musical. And it is fair to say they all have issues and problems both individually and collectively along the way. But the thing that really holds it together and makes it great, is the songs. They had some very big hits and they are all sung live by the very talented cast. It is a real life story of how money and success can alter friendships and situations. But also how certain bonds are built up with people that just cannot be broken. The music and the harmony’s are so good. It will leave you feeling happy and hyped up, like any good musical really should in my opinion. I am really glad I finally went to see it. But I already knew beforehand that I would not be disappointed by it. 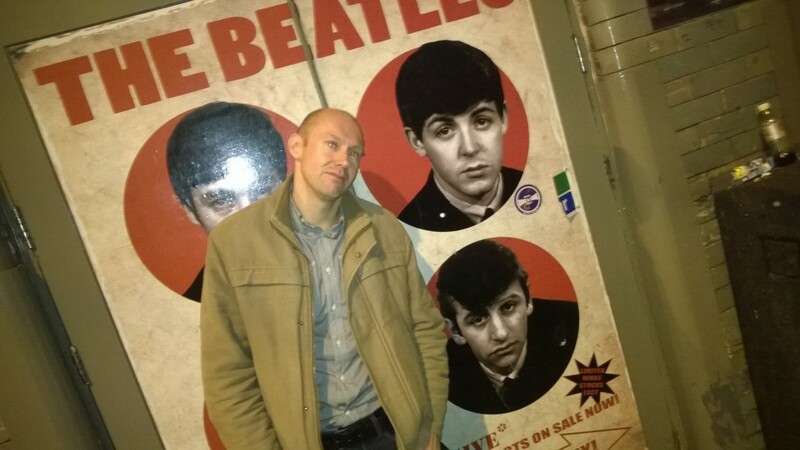 I enjoyed a fun night out recently with a few of the people I work with at Wembley Stadium. A fairly low key night. We just met in pub that is part of a well known chain of Irish Bar’s in Kings Cross. Whose full name is pretty similar to my first name. We then went on to a bar around the corner. Where the fantastic Rockaoke band were playing. Just in case you are not familiar with these guys. They are a group, who provide a slightly different take on karaoke. They play the songs totally live and supply all the words. You just hop on stage with them and sing. I met them in January at a birthday party in Oxfordshire. They were brilliant then and my mate Jeff Nolan got up and did a few numbers with them. Which was ace. 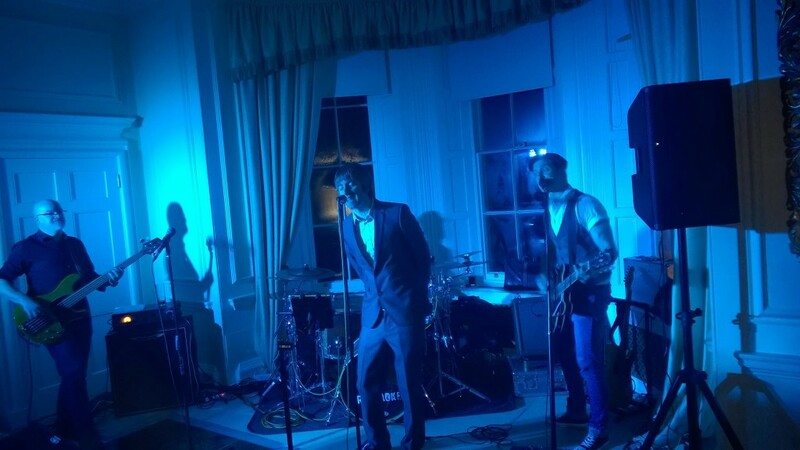 They have also played on most of the Chris Moyle’s Show Tours, at Carfest events and backstage at some pretty cool places including the V-Festival. They were once again excellent. And they do seem to attract a better class of singer than normal karaoke’s. Although I guess to get up there and sing with a full band. You at least have to have a little bit of confidence. That you know what you are doing. That said the group are ace and would help you out were it required vocally, I believe. To save the ears of the audience if nothing else. They were very popular in the pub that night. When we arrived there all the slots to sing for the rest of the evening had already been booked up. I look forward to seeing them live again soon. 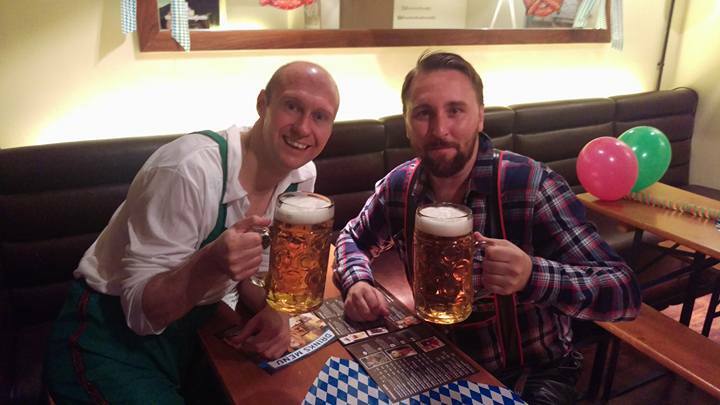 I have been lucky enough to go to the actual Munich Beer Festival, the original Oktoberfest on two previous occasions. Both times I went with friends and we stayed at a camp site about thirty minutes from Munich. It is an amazing event. They have around fifteen big Bierkellers, all of which represent the different beers and hold around four thousand people. You end up drinking, talking, then as the evening wears on singing and dancing with people from all over the world. The atmosphere is electric. Everyone is there to just have a good time. 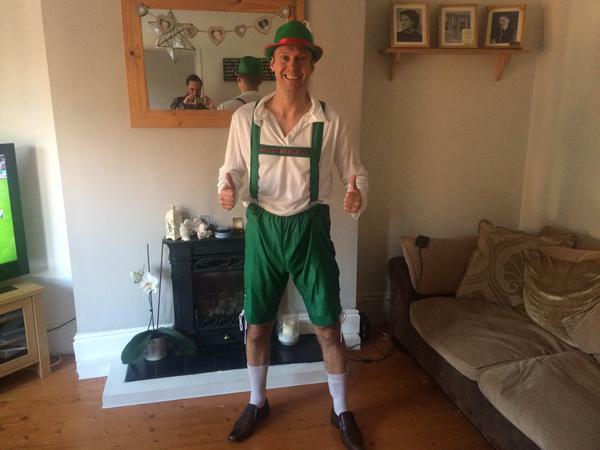 Plus the Oompah band’s play their own versions of lots of very well known party hits. All of which sound great after a few steins and may be a large pretzel. 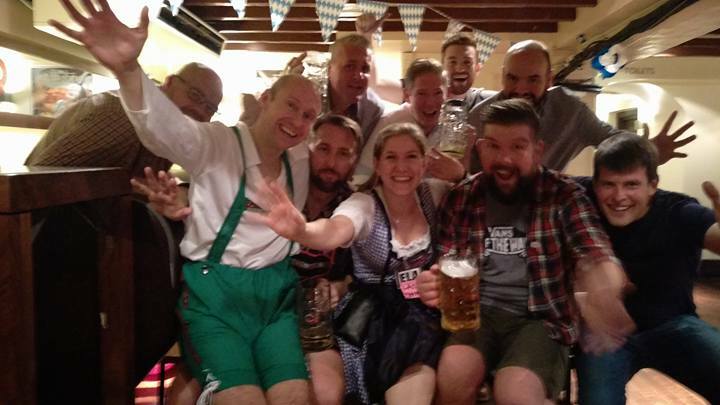 Anyway so last Saturday I went to an Oktoberfest Night at a Bavarian Bar in the Tower Hill area of London. It was organised by Lee Bryant, who runs the Laughing Badger Comedy Club in Hemel Hempstead. He spoke to me ages ago about it and told me that he was dressing up for the occasion. So I said that I would do the same. After much debate about how we were going to get there and where we were going to meet. He suggested I stay at his so we could travel up and back to the Capital together. As I did not really fancy moving through London on my own in an unfamiliar outfit. I took him up on his very kind offer. Specially after he guaranteed that he would cook me a big fry up the morning after. He lives near Harpenden, so we caught the train in to London from there. Both dressed up in our Lederhosen’s. I am not going to lie to you we did get some pretty strange looks. People were either trying to completely avoid us, not get eye contact with us or engage us in a short conversion. I think the latter just wanted to make sure we were heading somewhere appropriate dressed in these strange clothes. The tube across London was not any less of an embarrassment. With everywhere full of people and everyone accept us in more normal weekend attire. We arrived at the venue, met the other six people in our party. Only to find out that with the exception of the staff and one other group of four people we were the only ones who were dressed up in the whole place. Do not worry this did not stop us having a great time. Everyone there was very friendly and I lost count of the number of people who wanted to have a go with my drinking hat. The waitress who looked after us Ella from Frankfurt was lovely. The beer flowed rather nicely and the three piece Oompah Band they had wandering around were a right laugh. They were happy to get involved, do requests and have us sing along with them. Plus in between the band they also played in some big party songs. So we could have a good old sing and dance. Now many, many years ago when I started out. I used to with a group of friends of mine do disco’s for Stoke Mandeville Hospital Radio. We developed a bit within our performance’s. Where we would bring in a few little props and then lead the dances to a few big floor fillers. Our main number was the YMCA complete with all the head gear required to replicate The Village People. When we did it back then it always used to go down a storm. Well last Saturday night in that bar. Along with Lee and the staff. For one night only I joined in with a special version of that dance. I can confirm that I can still remember all the moves by the way. I am just hoping that no one was videoing it on their mobile phone. That really was not a problem when we were doing that the first time around. Nobody even had phones let alone ones that could film things. So for my Mum’s slightly belated Birthday treat I took her for a day out it London. She told me that she had not really been sight seeing there for about thirty years and fancied having a look round. So I obliged. 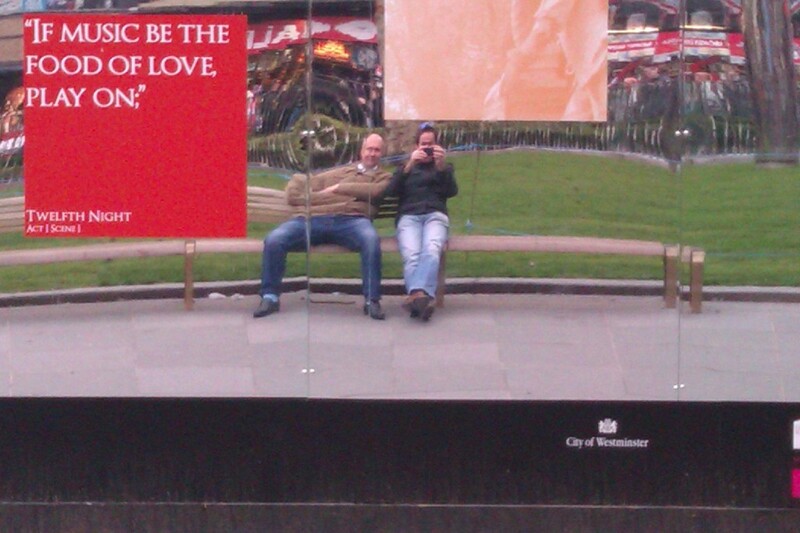 We started off in Piccaddilly Circus then headed through Leicester Square. 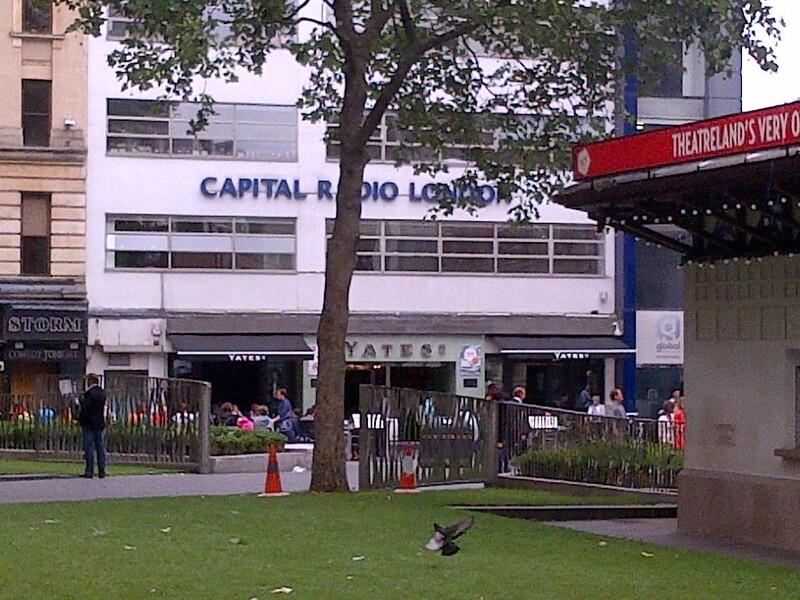 Just as we were going past the Capital Radio entrance Amanda Holden came out of there and started walking right behind us. Then suddenly a few photographers arrived on the scene trying to take pictures of her. The photographers were in front of me and my mum. While Amanda was walking behind us still, trying to use us as a bit of a shield I think. She eventually over took us and then jumped straight in to a waiting car. She must get that all the time but it did seem a bit odd with people shouting at her and all these camera flashes going off. Although secretly I may have enjoyed it a little bit. By the way for the record she looked stunning and was very friendly and polite to everyone. From here our huge walking tour of London took us via Trafalgar Square, St James Park. Buckingham Palace, The Mall, Horse Guards Parade then to Downing Street, Westminster Abbey, Houses of Parliament, South Bank and finally on to St Paul’s Cathedral. Where opposite we found a really nice Italian Restaurant for dinner. Before continuing on to Fleet Street, Covent Garden then ending up in my favourite pub in London Waxy O’Connor’s to enjoy a well earned pint. A successful and fun day spending time with my mum. 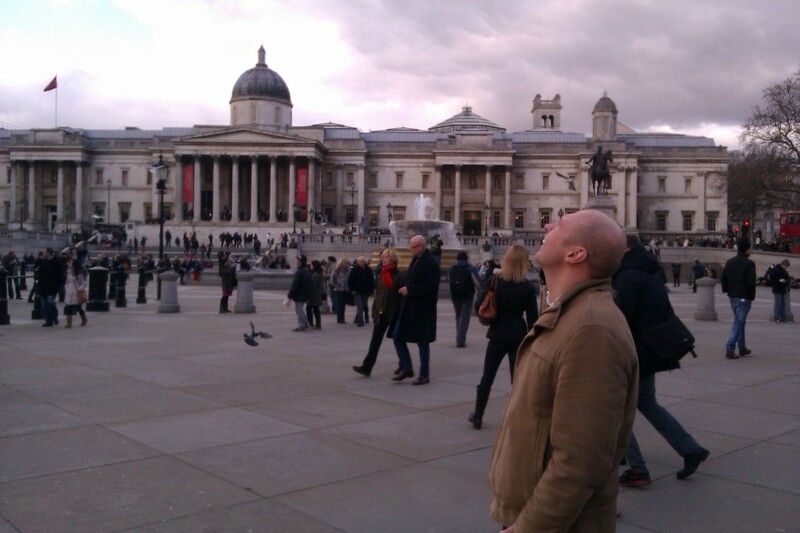 And enjoying the many delights of our Capital city. Plus the weather was great. 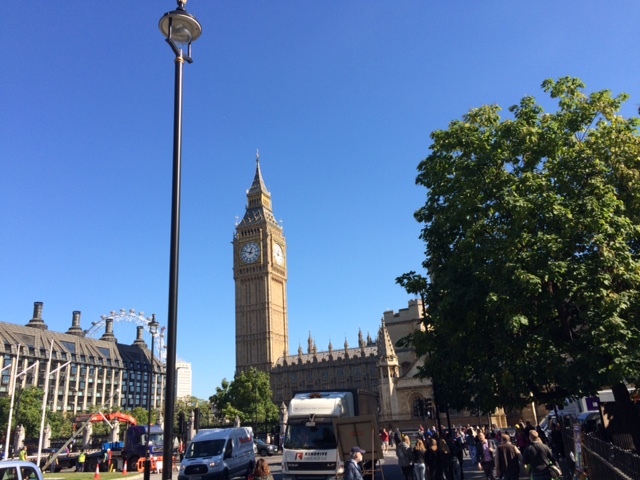 London always looks amazing when it is sunny. So since we spoke last Chris Moyles has returned to the airwaves. He is now back presenting The Chris Moyles Show on newly launched Global station Radio X. I am a big fan of his work, so I did listen in to his first Breakfast Show. It is going to be interesting to see how he will manage to compete with the big hitters on what nationally is mainly just a DAB station. But I am sure he is up for the fight and will give it a good go. He has started nicely and the station have spent quite a bit on publicity for it. Which should help a bit. I have met him twice over the years. 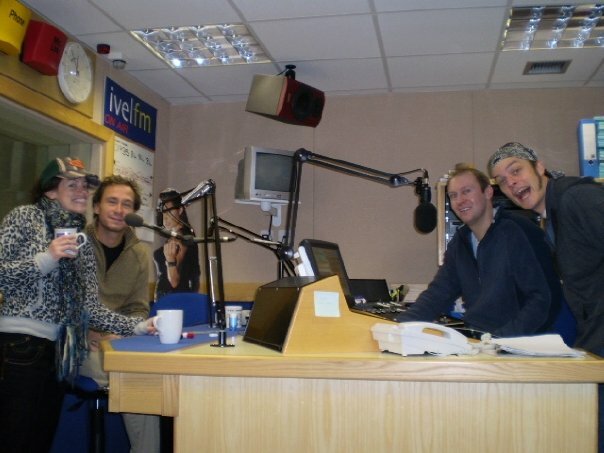 Once through the glass of what used to be Chiltern Radio in Dunstable. As an enthusiastic teenager I went for an interview late one evening for a Technical Operator’s Job for the AM Super Gold station that broadcast from the same studio complex. I could see him through the glass doing his show and I have to confess was watching and staring at what he was doing. When he then came on the studio talk back to advise me that he wasn’t a goldfish. The second time was at a book signing in Yeovil. When I was working at a radio station down there. I nipped out in my lunch hour to get a copy of his book signed and have a brief chat. I thought it would be amusing to give him a pen from Ivel fm. Where I was working at the time. I wonder if he still has it? He in turn asked me to give him a mention on my afternoon show. Now as much as I like him. I was certainly not going to suddenly promote another radio station. So I just gave a shout out to Chris from Leeds down in Yeovil and wished him luck with his new book. He will do a great job at Radio X.